We do like vampire outfits. All that black and red and satin all over? Not to mention lace, collars, capes, and tulle. We're totally in love with those romantic Gothic threads. Of course, those typical vampire outfits look fantastic, but they usually don't offer much in the form of practicality. For instance, have you ever seen a gown of a Lady of the Night with pockets? We thought not. 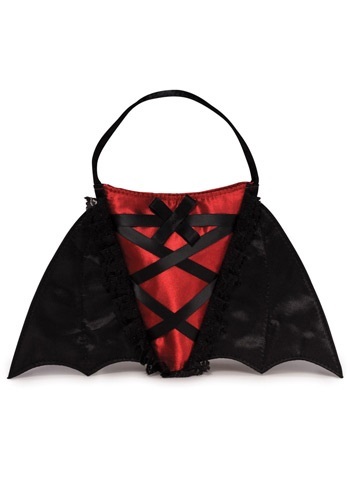 Which is why we offer some glorious vampiric accessories, such as our Vampire Purse. This little red and black number has red satin accents, a short handle, a snap closure, and bat wings for affect. That way you can carry whatever you need while not spoiling the look of your marvelous outfit. We're total suckers for a good accessory.